It has become a serious social problem that the accidents caused by the deterioration and/or exfoliation of pieces from concrete structures due to the low-quality construction. To detect such defect parts in concrete structures, the Impact Acoustic Method (IAM) is usually used for the non-destructive inspection at the present. However, it is obvious unreasonable for the current IAM that the integrity degree of concrete is judged by the personal sensitivity and experience, which depend on the auditory sense of the inspectors in a large extent. Therefore, it is impossible to diagnose the integrity degree of concrete structures quantitatively with the current IAM. To overcome the above shortcoming, the authors have carried out a series of experiments and analysis to grasp the characteristics of the impact acoustics and investigate the possibility for quantitative assessment of integrity degree. The impact acoustic experiments were conducted by exerting the stroke to the concrete specimens with a hammer under distinct impact condition. The concrete specimens were prepared carefully to ensure the clear material features, sizes and boundary conditions. 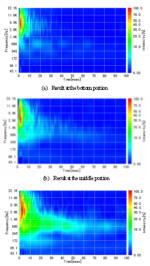 Based on the knowledge obtained in these experiments, a methodology, which can quantitatively presume the effects due to the concrete strength, the inner defect and the boundary condition of structure, has been developed and proposed herein. Furthermore, according to the proposed procedure, a portable system for the impact acoustics test has been made up. The algorithm of quantitative evaluation for the test system is based on the wavelet analysis that is suitable to a fast computation for practical inspection in field[1,2]. This paper represents a description about the analysis model for the evaluation of integrity degree, the property of the test system and the adequacy verification of the proposed methodology. Unlike other methods to evaluate the absolute integrity degree of structures, the method proposed herein is for evaluation of the relative integrity degree of structures, which is necessary in the practice of structure maintenance. Namely, the purpose of the method is to extract the defect parts from a large amount of objective structures quickly and efficiently, by relatively comparing the sound and unsound parts of the structures. In addition, the input energy of impact varies with the intensity of a stroke exerted to the object by a hammer. 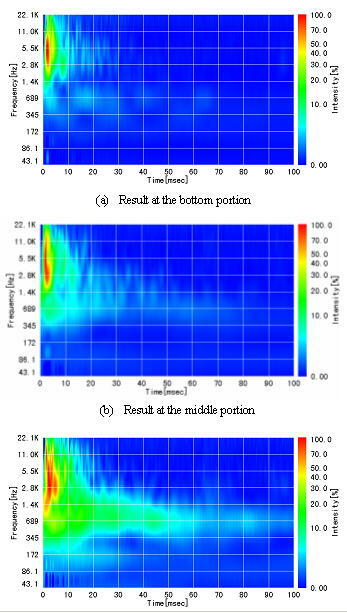 Since it is difficult to control the intensity of stroke to a constant level exactly in an in-situ inspection, the effect due to the variation of the stroke intensity is removed by normalizing the amplitude of the acoustic waves in time domain. Table 1: Specifications for the property of microphone and the condition of data collection. Because the up-limit frequency of sound that can be heard by humankind is about 20 kHz, the sampling frequency is set as 44.1 kHz for the proposed method. Considering the convergence time of acoustic waves, the time for sampling is set as 100 msec. The microphone used for the system is made by Earthworks Company, USA, which has directional behavior satisfying the frequency range until 50 kHz. For the convenience to in-situ tests, the sound-collecting part of the microphone is placed close to the position stricken and uncovered while collecting the stroke sound. Given in Table 1 are the specifications for the property of microphone and the condition of data collection. Fig 1: Outline of IA(Impact Acoustic)System. 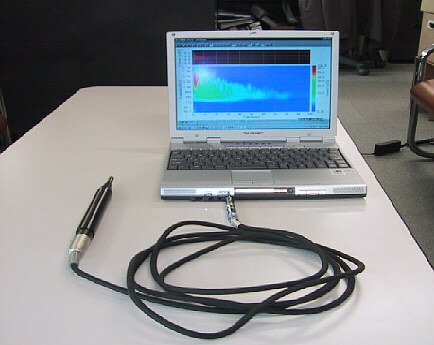 In addition, a measurement system called IA (Impact Acoustic) System was used for the experiments and analyses in this study, which was also developed by authors as shown in .Fig1. The calculation algorithm for the proposed method is based on the wavelet analysis to which there are many kinds of mother wavelet can be used. After trying several kinds of mother wavelet, the Battle-Lemarie mother wavelet is adopted in this study. Comparing with the other mother wavelet, the shapes of component waves transformed by the Battle-Lemarie are mostly close to sinusoidal waves corresponding to all the frequency components. The index of integrity degree for the evaluation is determined based on the variation of frequency components within a short time and the characteristics of intensity decay for all the component waves. 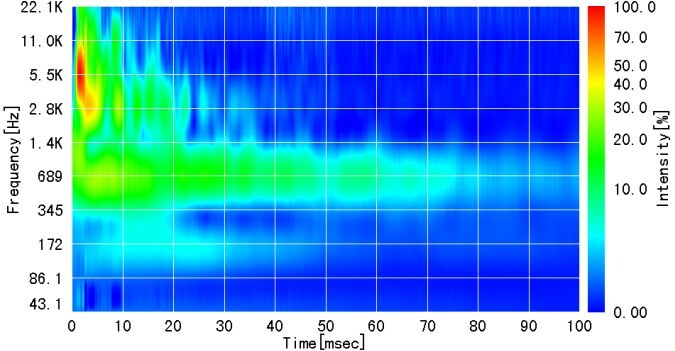 Given in Fig.2 is the illustration about the conception of integrity evaluation according to the results of wavelet analysis, which represents the relationship among the continuing time of sound, the frequency and the intensity of the components contained in the sound recorded. Based on the knowledge obtained through the various experiments described later, the integrity degree of the specimens can be evaluated by focusing on the characteristics corresponding to the following three types of frequency zones (Zone A to Zone C). Moreover, the aforementioned effect due to the variation of stroke intensity is removed by normalizing basic scores. The basic scores are the summation of the values of moving average (namely, effective values), which are calculated from the results of wavelet transform. The time interval for calculation of the summation is 0-2 msec. Fig 2: Illustration showing the concept of integrity evaluation according to the results of wavelet analysis. Zone A shown in Fig.2 reflects the characteristics of concrete strength. The characteristic of this zone is that the frequency of the component wave in this zone increases as the concrete strength increases. The intensity of the components in this zone is absolutely higher than the other two zones (Zone B and C) described later. Also, the intensity of the component decays so fast that the continuing period is only several msec in this zone. The concrete strength on the surface of objects can be evaluated focusing on the characteristics of frequency distribution within 5 msec after impacting. Zone B shown in Fig.2 reflects the state of the defect inside the objects, whose triangle shape is determined by the different decay time corresponding to the various components of frequency calculated with the wavelet transform. When there is no defect existing inside, the triangle shape becomes vague, or the intensity is weak for this zone.The inner integrity of the objects can be evaluated by calculating the decay time of the effective values that is based on the results of wavelet transform. The process of the evaluation is as follows. Determining objective components for Zone B: The waves of components for Zone B are determined by comparing their maximum effective values to those in Zone A. For the components outside Zone A, if the maximum effective values reach the quantities over 50% of the maximum effective value in Zone A, the components are taken as the objective for Zone B. Determining threshold intensity of decay: Corresponding to the each component of frequency, the quantity equal to 5% of the maximum effective value is determined as the threshold intensity of decay. Calculating average time of intensity decay: Corresponding to the each wave of component in Zone B, the time when the effective value decays under the threshold intensity is calculated. Then, the average time of the intensity decay for the all waves of components in Zone B can be obtained. Zone C represents the characteristics of the boundary condition or the holes inside the specimens. If the boundary condition makes the specimen vibrate freely after impacting, or there are holes existing in the specimen, the continuing time of the stroke sound becomes long, which makes Zone C dominating. The process for evaluation of Zone C is same as that described in (2). Firstly, the times of intensity decay are calculated for all the frequency components. Secondary, the longest one among those calculated is determined as the maximum time of intensity decay. Finally, with this maximum time, the situation of the inner holes and boundary condition of the specimens can be evaluated. As what shown in Fig.3, a total index for general evaluation of the integrity degree can be achieved by modifying the normalized effective values with the weight coefficients in the domains of both time and frequency. To reflect the shape of the weight coefficients with two dimensions as shown in Fig.3, the total index is called total score, which can evaluates the general integrity degree influenced by the concrete strength, inner defect and boundary condition etc. The weight coefficients is called slope score are determined based on a large amount of experiments, where the large coefficients are set for the zone with high frequency and the small ones for the low frequency. After the effective values corresponding to the frequency components are multiplied by the weight coefficients, the total score can be calculated by taking a summation of all the effective values modified. Therefore, the high total score means the objective structure possessing high degree of integrity under general evaluation. Fig 3: Weight coefficients in the domains of both time and frequency. To verify the adequacy of the proposed methodology, various kinds of concrete specimens or structures with the different strengths, the defect patterns and the boundary conditions were taken as objects and the comparison study was carried out based on the impact acoustic tests. Given in the following are the description about the experiments, and the main results of the comparison between the integrity evaluation and the actual state of the objects corresponding to the aforementioned Zone A, Zone B and Zone C as well as the general evaluation. Fig 4: Analyzed results of the specimens with low strength and high strength. The impact acoustic tests were conducted using the three kinds of concrete specimens that were made up with low, middle and high strengths. The analysis results of the specimens with the low strength (FC10 : 7.8 Mpa) and high strength (FC36 : 45.6 Mpa) are shown in Fig.4 (a) and (b), respectively. From these figures, the appearance of Zone A represents the following characteristics obviously. The frequency components within the short time, 5 msec after impacting, show extremely high intensity. The frequency of the zone with high intensity is mainly between 2.8 kHz and 11 kHz. The intensity of this zone decays so quickly that the dominant components continue for 5 msec only after impacting. Furthermore, comparing to the result of the specimen FC36 whose Zone A dominates between 5.5 kHz and 11 kHz, Zone A of the specimen FC10 dominates at the low frequency level about 2.8 kHz. Therefore, the difference of concrete strength is reflected clearly by the frequency variation within Zone A. Fig 5: Analyzed results of sound portion and unsound portion with honeycomb. The object for examination of inner defect is an actual culvert for highway. There are several areas with obvious honeycomb in the side wall and ceiling of the structure. Comparison experiments were conducted by impacting the sound and unsound areas in the structure. Given in Fig.5 (a), (b) are the analysis results corresponding to the unsound areas with honeycomb and the sound ones, respectively. From Fig.5 (a), the following characteristics due to the effect of honeycomb are confirmed. The area with high intensity appears within a very short time of 3 msec after impacting. The frequency of the area with high intensity is mainly between 2.8 kHz and 5.5 kHz. Unlike the intensity corresponding to the high frequency decays quickly, the intensity corresponding to the low frequency remains for a long period which dominating in the triangle shape. From what described above, the Zone B reflects the characteristics of the inner defect caused by the honeycomb in structures. Since the boundary condition of the object is affected by various factors, the three kinds of specimens were prepared for the comparison experiments as follows. Given in Fig.6 is the schematic illustration of the specimen used in the experiment, which was cut from the existing concrete fence wall of a highway structure. The coordinates of the points impacted is determined by the horizontal lines (from Line i to v) and the vertical lines (from Line A to F). As the thickness at the bottom of the wall fence corresponding to Line i is 50 cm which is most thick comparing with other horizontal lines, the boundary condition of Line i contacting the ground is close to the fixed state. On the other hand, the thickness at the upper part of the wall fence is only 20 cm, whose boundary condition is nearly free. Fig 6: Schematic illustration of specimen. Fig 7: Results for concrete fence. The analysis results are shown in Fig.7 and Fig.8. Given in Fig.7 (a), (b) and (c) are the results of the positions, which are crossing points between Line C and Line i (bottom), Line iii (middle) and Line v (top), respectively. Since the boundary condition of the point at bottom is close to the fixed state, in Fig.7 (a) there is only Zone A dominating, which appears around 5.5 kHz continuing for a short time of 3 msec. Zone B and Zone C are not observed in the figure. As to the result of middle part shown in Fig.7 (b), it is confirmed that the onset of Zone C appears around 689 Hz. The result of top part shown in Fig.7 (c) represents the distinct Zone C around 689 Hz continuing for a long time. Therefore, as the supporting condition varies from the fixed state at the bottom to the free state at the top, the residual sound becomes clear, which is reflected by Zone C. With regarding to Zone A, the patterns are almost same from the bottom to the top, which means that there is no difference for the concrete strength. Fig 8: Result of the crossing point between Line v and Line A for concrete fence. Even if the positions at the same horizontal line, e.g. Line v, there is difference for the residual time of Zone C between the vertical lines at the two ends (Line A and Line F) and the middle (e.g. Line C). Given in Fig.8 is the result of the crossing point between Line v and Line A. Comparing with the 50 msec residual time of Zone C for the point in Line C (Fig.7 (c)), the 70 msec for Line A is observed. This is because that the positions at the two ends are freer to make the residual time long. A specimen with four different thickness of plate was made up for the experiment. The schematic illustration of the specimen is shown in Fig.9, and its analysis results are shown in Fig.10. Fig.10 (a) is the result corresponding to the case with the thickness of plate equal to 100 mm, where the residual component about 700 Hz is confirmed. Also, Fig.10 (b) is the result with the thickness of 200 mm, where the residual component about 1.4 kHz is observed. On the other hand, in the results corresponding to the thickness of 300 mm and 400 mm, as shown in Fig.10 (c) and (d), there is no residual component observed. Fig 9: Schematic illustration of specimen. Fig 10: Results with variation in thickness. Given in Fig.11 is the schematic illustration of the specimen with the two cracks extending from the surface to interior in different angles of inclination. In this experiment, the effects of boundary condition due to the cracks are examined. In the results shown in Fig.12 (a) and (b) corresponding to Point 1 and Point 3, which possess the sound supporting condition, there is no Zone C existing. Conversely, in the results shown in Fig.12 (c) and (d) corresponding to Point 2 and point 4, whose supporting condition is unsound because just over the inclined cracks, the residual component appears obviously around 1.4 kHz for the both cases. Fig 11: Schematic illustration of specimen with two cracks. With regarding to Zone A that reflects the characteristics of concrete strength, there is a little difference between the cases with sound supporting condition (Point 1and Point 3) and unsound supporting condition (Point 2 and Point 4). Namely, in the former case, the continuing time of the components with high intensity is shorter than that in the later case. The original function of Zone A is to evaluate the concrete strength. However, under these cases where the strength behavior is same, the cause to make such difference in Zone A should be investigated further. The aforementioned total score is a total index for the general evaluation of integrity degree, which is achieved by modifying the normalized effective values with the weight coefficients in the domains of both time and frequency. Given in Fig.3 is the schematic illustration of the weight coefficients used in the comparison experiments. For the components with high frequency and within the short period after impacting, the effective values are multiplied by the plus coefficients. One the other hand, for the effective values with the long residual times, the coefficients are set as minus values. After modifying with the slope score (weight coefficients) in this way, the summation of the effective values are taken as the total score for general evaluation. If the total score is high, it means that the object possesses high integrity degree with the sound material and boundary condition, conversely, the low integrity degree with unsound ones. At present, the precision of the total score has not reached the level for an absolute evaluation, but for a relative one. In other words, within a structure or specimen the general integrity degree for different parts can be evaluated relatively with the total score. Given in Fig.14 are the total scores corresponding to the specimens possessing the plates with different thickness and the cracks. Herein, the scores are the average values based on five records collected in the impact acoustic tests. Fig 13: Total scores of specimens. In the aforementioned results of wavelet transform obtained in the experiment of the specimen with variation in thickness of plate, there is difference to the boundary condition between the cases with thickness of 100 mm and 200 mm. But, as to the cases with 300 mm and 400 mm, there is no obvious difference existing. However, in the results of the total score, it is understood that the scores increase gradually as the thickness increase from 100 mm to 400 mm. Therefore, the cases with complicated structural condition can be evaluated by modifying the effective values with the weigh coefficients, where only the wavelet analysis is not enough. With regarding to the specimen with cracks, in the results of wavelet transform, there has been obvious difference to the sound and unsound cases already. After modifying with the slope score (weight coefficients), the difference becomes more obvious. To develop the IAM for non-destructive inspection of concrete structures, which can evaluate the integrity degree quantitatively, the methodology including the procedures for test and analysis has been developed in this study. The algorithm of quantitative evaluation is based on the wavelet analysis that is suitable to a fast computation for practical inspection in field. The evaluation is focusing on the concrete strength, the inner defect and the boundary condition of the structures. Moreover, the adequacy of the proposed methodology is verified through the comparison study based on a large amount of experiments. Finally, to improve the applicability, the precision for the IAM is going to be upgraded in future.